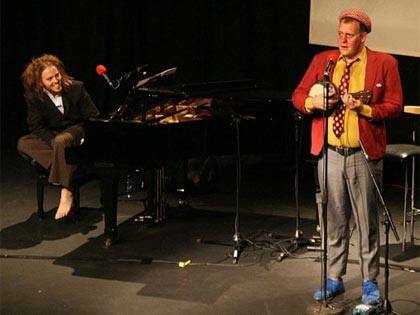 In 2006 moving Tim Minchin’s piano from the Gilded Balloon to the Assembly Rooms cost more than hiring Tim Minchin. Tim was a star from the moment he started his first run at the Edinburgh Fringe. I booked him onto our “Best of The Fringe” Radio 2 show with Dara O Briain and then pitched a solo show to Radio 2 controller Lesley Douglas. She said yes and Tim & I then worked up “Tim Minchin & Friends” which was recorded in the BBC Radio Theatre for TX on Radio 2 that Christmas. Tim was hot property, he penned a song about the BBC in the departure lounge at Heathrow airport with me before stunning TV controllers at their corporate away day, he signed up to one more Christmas recording with Radio 2 and was then ushered away to the US by his agent Chiggy.